Hello everyone, and welcome to #Day14 in our #DisneyWorldCountdown! One of the hottest tickets to get for Walt Disney World is a reservation for the Be Our Guest restaurant. I’ve tried over and over again for clients for months and have had no luck in getting a reservation for them. However, Disney knew that this would be the case, so they decided to make lunch a counter service restaurant, so you can experience it without needing to get frustrated over the lack of reservations. However, as you can imagine, this is a tough ticket also, and wait times are often quite long for this as well. My friend Sheila and I, though, thought it would be good to try this restaurant out for lunch, so we set down some strategies to try and get to the restaurant in as quick a time as possible but at the same time maintaining our dignity. Here are some of the tips that we came up with. Please let me know if any of these work for you, and any ones that you have tried that worked — or even failed — for you too so we can get a comprehensive list going! The first tip is that we thought we would stand in line and send the others out to do some other attractions. There are going to be seven of us for this lunch, so it seems like a good idea to get the others out and about and not waste their park time in line. Another strategy that we thought about was making our lunch an early lunch, and getting to the park early enough to get one of the first lunch times so that we won’t have to wait in line as long. If you try this, rumor has it that you have to be in line for the restaurant by 10:30 AM or earlier, so make that decision in plenty of time to get there. First lunch is at 11:00 AM. For lunch, Be Our Guest serves lunch until 2:15 PM, so another rumor that I’ve heard is that if you go over there around 1:00 or 1:30 and plan on eating a late lunch, you’ll have a shorter wait. Have you found this to be true? Let me know in the comments either way! You will need to login, and then provide your first and last name along with your Disney confirmation number. I don’t know if everyone has this ability to make a FastPass for it, or if it is on the same timeframe as the regular FastPass system (60 days), but we were able to do so. When you are in the system, you can decide to place your food order online and get your FastPass or you can just get your FastPass. Since there are so many of us, we decided to just get the FastPass. For us, it gave us 12:30-1:00PM to return for lunch. 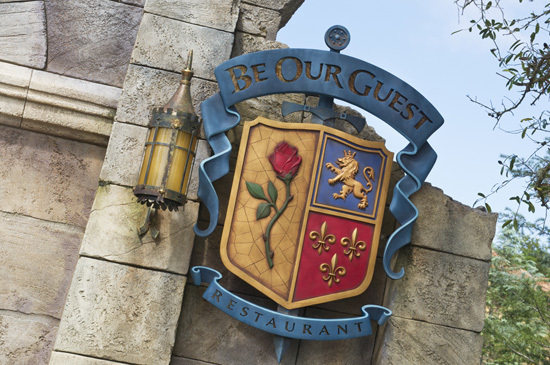 I hope that these tips are helpful in getting you that hard to get lunch at Be Our Guest! Let me know what tips you have, and thanks for stopping by today! Cinderella’s Royal Table is a 2 Table-Service Dining Credit option on the Disney Dining Plan. Located at the heart of it all, Cinderella Castle, CRT is one of those restaurants you really should experience at least once in your lifetime! Cinderella’s Royal Table has traditionally been the restaurant for us that we can do without. I don’t mean this in a bad way, because CRT is a good restaurant. However, a lot of what you are paying for when you eat at CRT is the location. However, we are planning on eating here during our trip in June with our friends. Here are the pros and cons for eating at Cinderella’s Royal Table. Location, Location, Location. The prime real estate that Cinderella’s Royal Table occupies is it’s primary selling point. Who doesn’t want to eat inside Cinderella Castle at least once? Photo Package. When you make your reservation for CRT, you receive a photo package with your reservation. You’ll receive one package for reservations up to four people, two packages for reservations of five to eight people, and three packages for reservations of nine to twelve. CRT is a character dining restaurant for all three meals — breakfast, lunch, and dinner. If you book a breakfast time before the park opens, you will be allowed to walk to the Castle, and take pictures of it without any guests in your shots! Breakfast is a standard Disney American breakfast. Experience. For those of you with little Princesses, it is every Princesses dream to eat at Cinderella Castle. The experience of saying, “I ate a Cinderella’s Royal Table” is something that not everyone can say, and it really is a memory that you will remember for years to come! Since I wrote this, my family and friends had a magical experience happen at Cinderella’s Royal Table. Come read about the time that Disney Magic Exploded at Cinderella’s Royal Table! The pros are great, and there are a lot more than I’ve listed here, but there are some things that detract from the experience. Here is my short list of cons for eating at Cinderella’s Royal Table. Price. The cost for Cinderella’s Royal Table is not cheap. Expect to pay between $36.99 – $59.99 per person when you eat at CRT, or expect to use two table service dining credits per person on the Disney Dining Plan. Noise. The dining room in Cinderella’s Royal Table is a bit noisy. If you are planning this dining location as a romantic getaway with your personal Princess, the noise may detract from that thought. Food. The food is good, but in my opinion, it isn’t great. It’s certainly not bad, and you may love it, but to me, it’s just good, not great. I hope that all of this helps you decide whether you want to eat at Cinderella’s Royal Table. If you have any specific questions, please feel free to leave them in the comments! Also, if you agree or disagree with me on anything I’ve discussed here, please let me know. 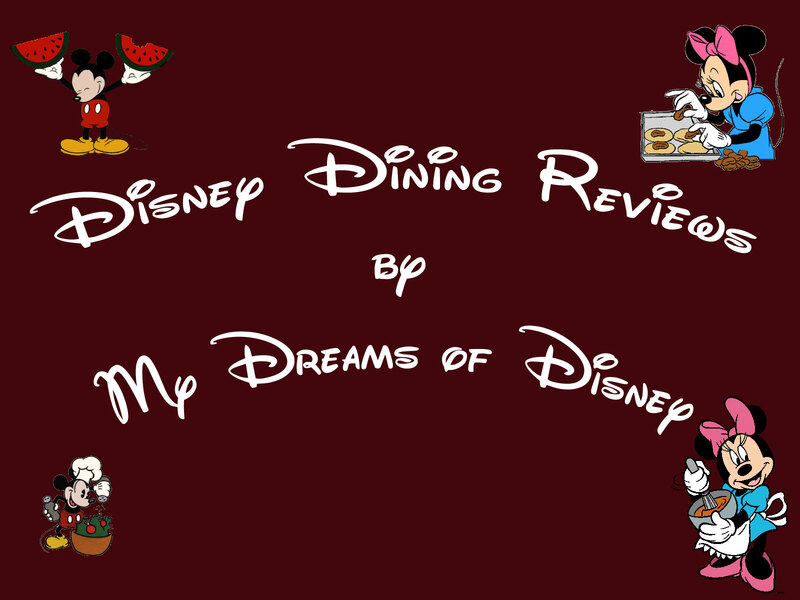 What is your favorite table service restaurant at the Walt Disney World Resort? During our vacation in June, 2010, we decided to try out the Cape May Cafe for the first time! I wanted a breakfast during our trip, so we booked a late breakfast time at the restaurant. The Cape May Cafe is located over at the Beach Club Resort, over in the Boardwalk area of Disney. We had so much fun at that meal! 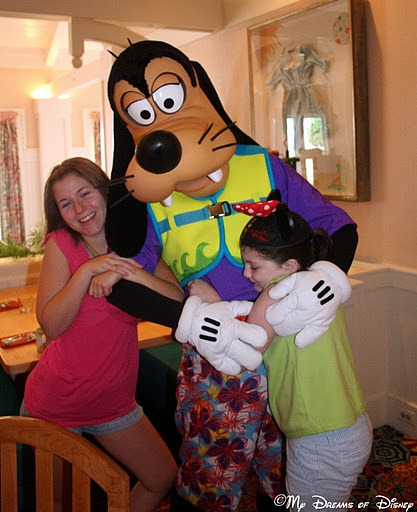 Cape May Cafe is a character meal for breakfast only, and we met Minnie Mouse, Goofy, and Donald Duck during our breakfast! Cape May Cafe is a buffet for breakfast, with Mickey Waffles, great fruit, awesome danishes, and much more. 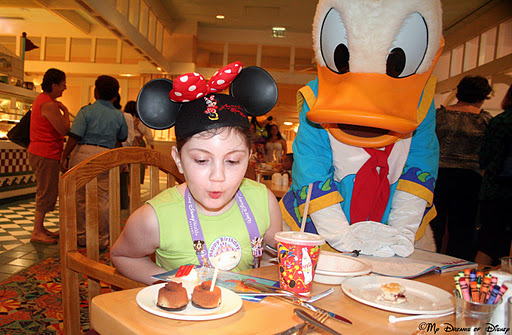 The beauty of any character meal, though, is the interaction that you and your children have with the characters, and Sophie (and my niece Stephanie, for that matter) had a wonderful time with the Minnie, Goofy, and Donald! Just look at these pictures to judge for yourself! Although we have eaten at the Cape May Cafe only this one time, this is definitely a restaurant that we would eat at again! The Cape May Cafe is a one table service dining credit on the Disney Dining Plan, and when paying out of pocket will run between $15 – $35.99 per person. If you have any specific questions or comments about the Cape May Cafe, go ahead and leave them in the comments! Thanks! The Pinocchio Village Haus is one of my favorite counter service restaurants. No reservations required, good food, a nice atmosphere, a view of one of our favorite rides in “it’s a small world” and great memories have made Pinocchio Village Haus a restaurant that we try to enjoy every time we visit. With it’s proximity in Fantasyland, the Village Haus is often a busy restaurant, especially during the summer months. As such, you might want to plan your eating times to be a little off from the normal lunch or dinner dining times. Maybe have your afternoon snack at noon or something, and plan on eating your lunch at a different time. Pinocchio Village Haus has a good assortment of Italian type dishes, including a meatball sub, individual size pizzas (which I think are quite tasty), salads, but also chicken tenders. Also, they have Sophie’s favorite meal in the world — PB&J! I highly recommend this restaurant, both for the food and the great atmosphere that you can experience!